Increasing migration of German families in the area around 43rd and Roanoke in Kansas City led Fr. Ernest Zechenter and others to realize that there was need for a church in this part of the rapidly growing city that would serve the largely German speaking population settling in this area. It is said that the idea of establishing a “German-speaking national church” for 40-50 families of German origin living west of the original Westport near the Santa Fe Trail was first discussed at a card game in 1908. In 1909 Bishop John J. Hogan gave permission to establish a “German national” church which would serve the needs of German-speaking population moving into that area. 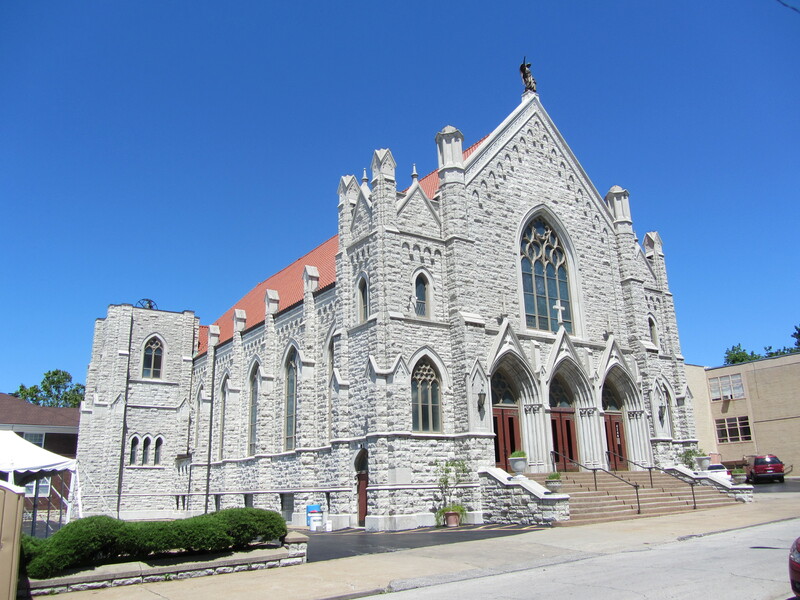 The Schutz Ange Kirche (Guardian Angel Church) was established in 1909 and the parish was formally designated for all German-speaking Catholics in the south part of Kansas City. Although Catholic parishes are generally based on a specific geographic area within an archdiocese or diocese, the influx of immigrants who did not speak English created the need for parishioners to have priests with whom they could communicate, whose sermons they understood, and for whom confession would be intelligible. As a result, bishops in the United States frequently established so-called “national churches” to serve the needs of growing populations of ethnic minorities who shared certain language and social/cultural traditions. The first services in Schutz Ange Kirche were held in a vacant grocery store at 43rd and Belleview. Parishioners decided to build their new church at the southeast corner of 43rd (Old Santa Fe Trail) and Mercer. The first mass was celebrated on the Feast of the Guardian Angels on October 2, 1909. Construction of the late-northern French-style Gothic building began in March of 1922. The first mass in the new church was on Christmas Day, 1923, even before the building was finished. The interior had not yet been decorated and the stained glass windows had not yet been installed. The windows were fabricated by Munich Glass Company of Chicago. The new church building was dedicated on May 4, 1924. During World War I many Americans distrusted citizens of German descent and there was great animosity toward them. In 1918 a large flagpole flying the American flag was erected outside the church in order to show the patriotism of Guardian Angel parishioners. Although many of the parishioners still spoke German as a first or second language, the use of English in church services became more common. By 1918 one of the Sunday masses at Guardian Angel was being given in English to accommodate the mostly Irish and other non-German speaking families living in the vicinity of the church. However, German still remained a second language of the parish for many years. The presence of a national church for German speakers ended in 1918 when Bishop Thomas Lillis designated a geographic area that would now serve all Catholics in the parish area. However, it was not until 1926 that Bishop Lillis formally changed the status of the church from a “German national church” to a “territorial parish” serving all of the Catholics within its assigned borders. 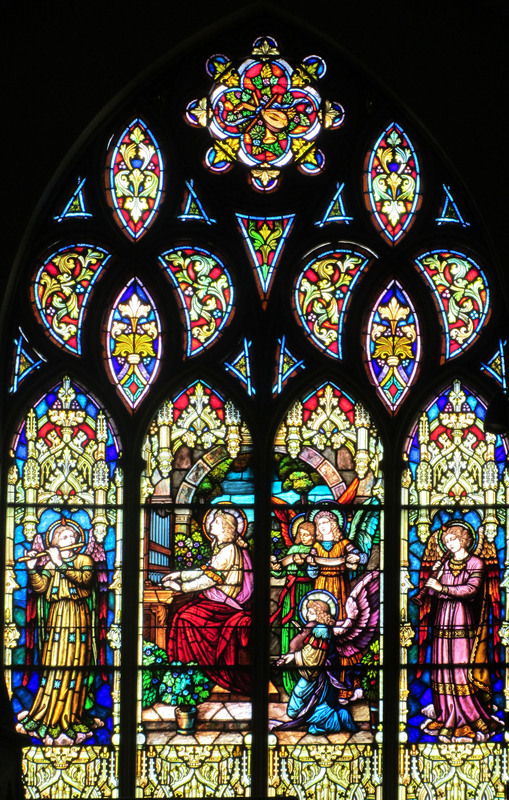 In 1991-92 the stained glass windows were refurbished and repaired by Hopcraft Stained Glass Studio of Kansas City, Missouri. There are five large double-paneled figurative windows on both the North and South walls of the nave. 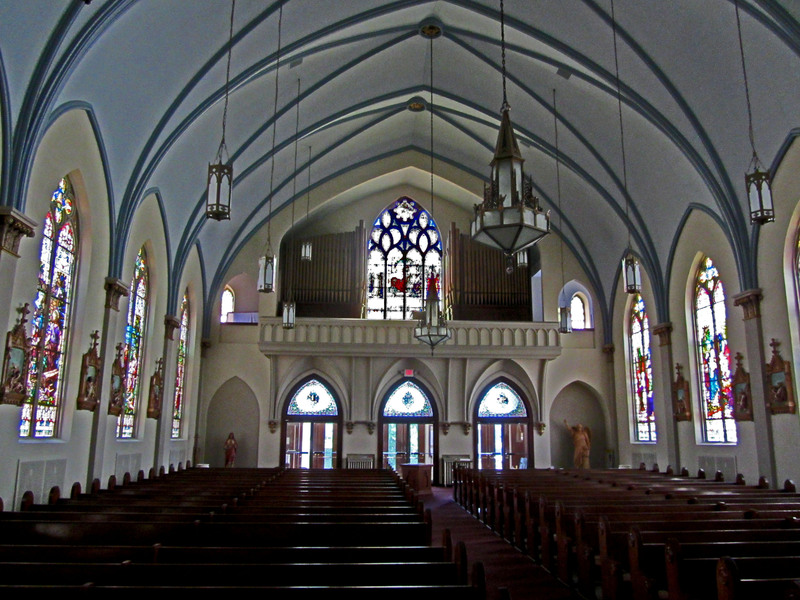 Four smaller windows are above and on either side of the altar in the area of the sanctuary. There are three smaller windows at the rear of the nave and two windows in a small room off the front hallway. 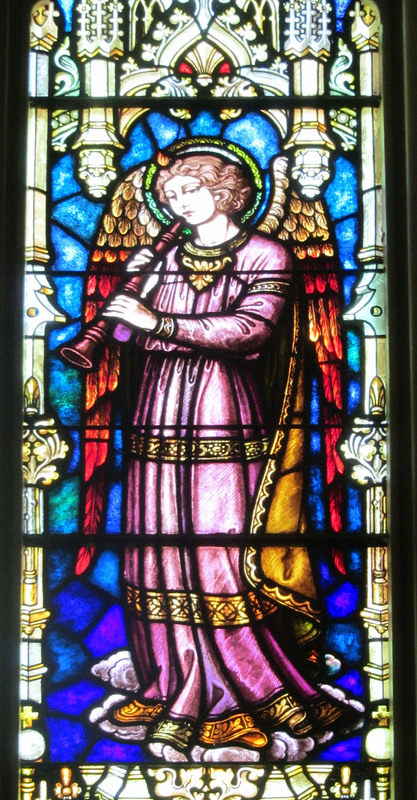 Above the organ loft is a large window showing Saint Cecilia and several angel musicians. 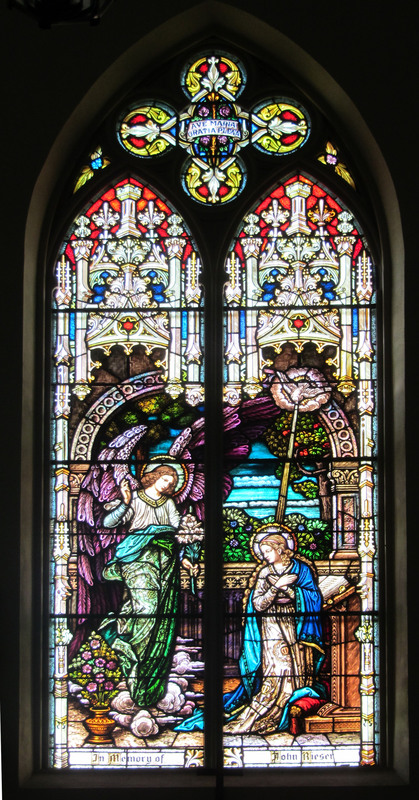 In this window we see a splendid depiction of the Annunciation of the Blessed Virgin Mary as related in Luke 2:26-38. 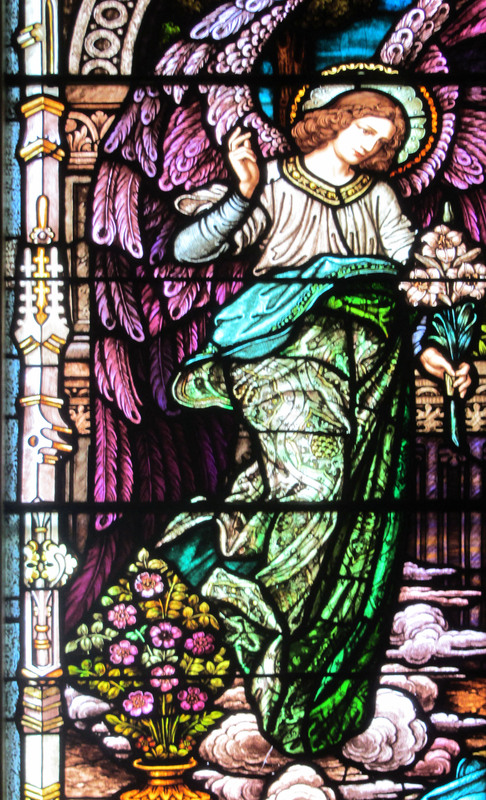 The angel Gabriel having taken the form of a man, came to Mary in her house in Nazareth and said “Hail, full of grace (favored one), the Lord is with thee.” On the left, the Angel Gabriel in flowing garb and full-spread wings holds a lily. On the right, Mary in her blue gown has been interrupted in her devotion and looks up. The Dove of the Holy Spirit descends to her. The Latin words “Ave Maria” at the top of the window mean “Hail Mary.” The Feast of the Annunciation is commemorated on March 25. 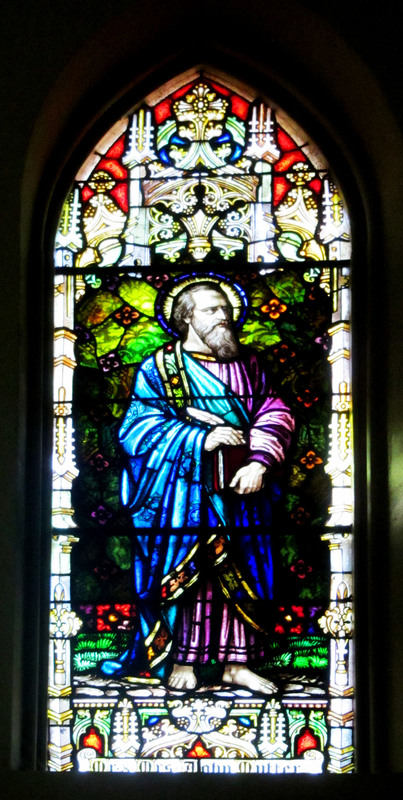 This window is dedicated in memory of John Rieser. 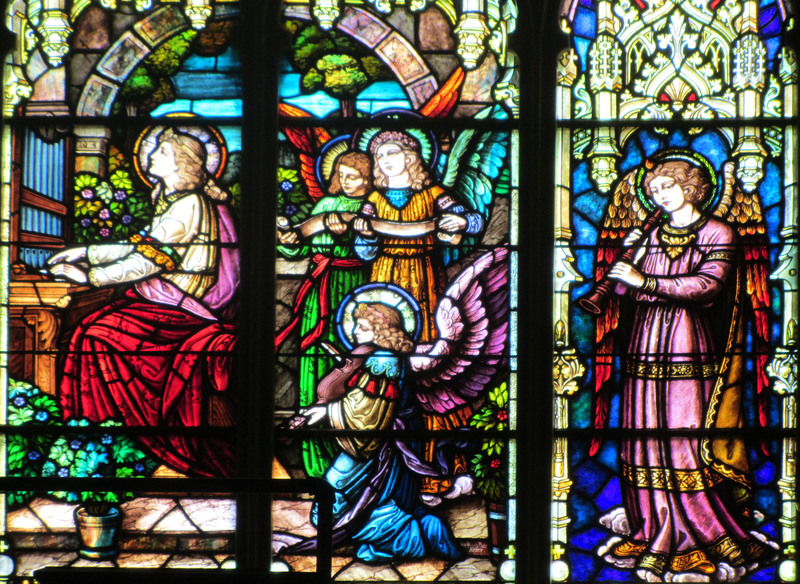 The second window moving away from the altar is a depiction of the Nativity. As told in Luke 2:1-20, a group of shepherds (and towns’ people) are looking at the infant Jesus as Joseph and Mary also look on. 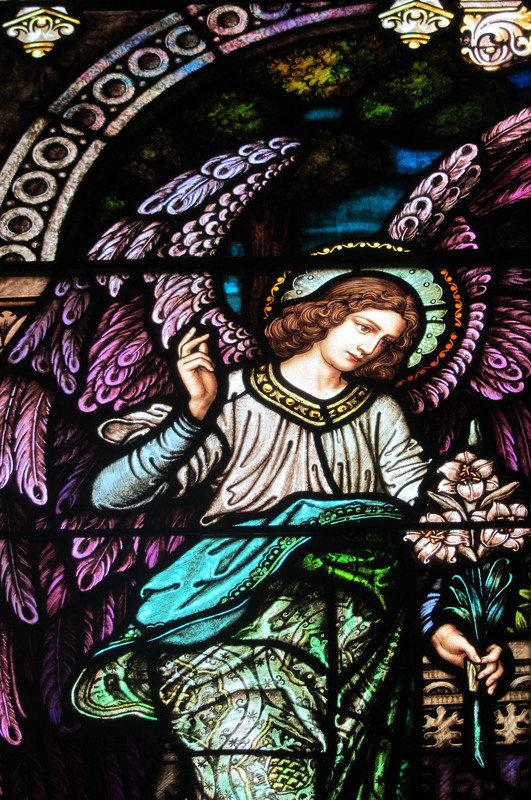 The Latin words at the top of the window, “Gloria in Excelsis Deo,” mean “Glory to God in the highest heaven” and are words the angels sang praising God. The Feast of the Nativity occurs on December 25. 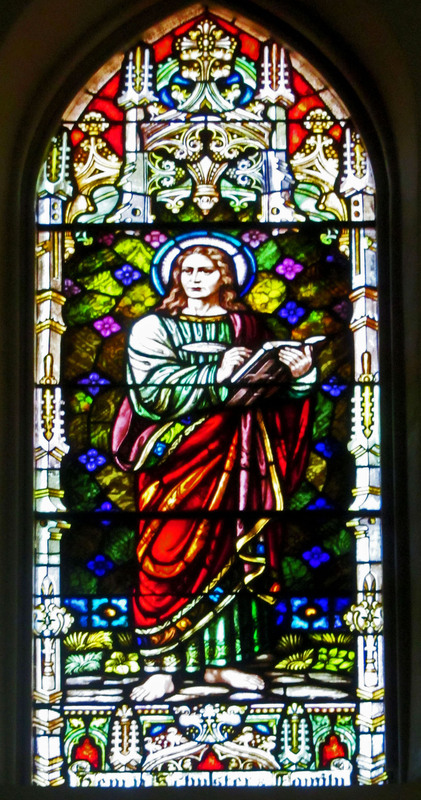 This window is dedicated in memory of Joseph Meyer. The Epiphany story is found in Matthew 2:1-12. 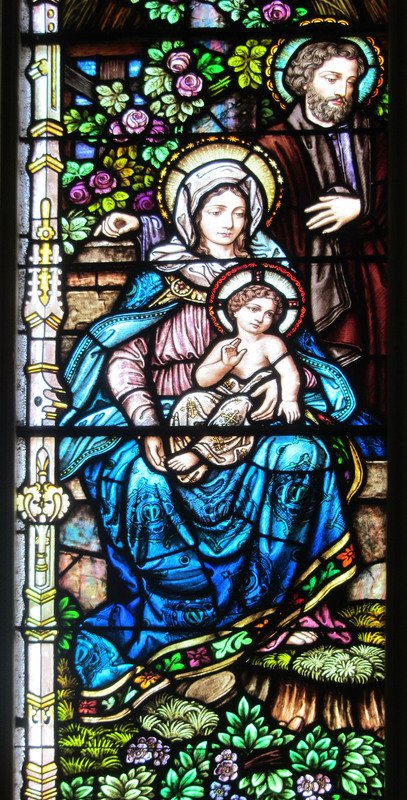 In this window, the left panel shows Mary holding the infant Jesus as Joseph looks on. 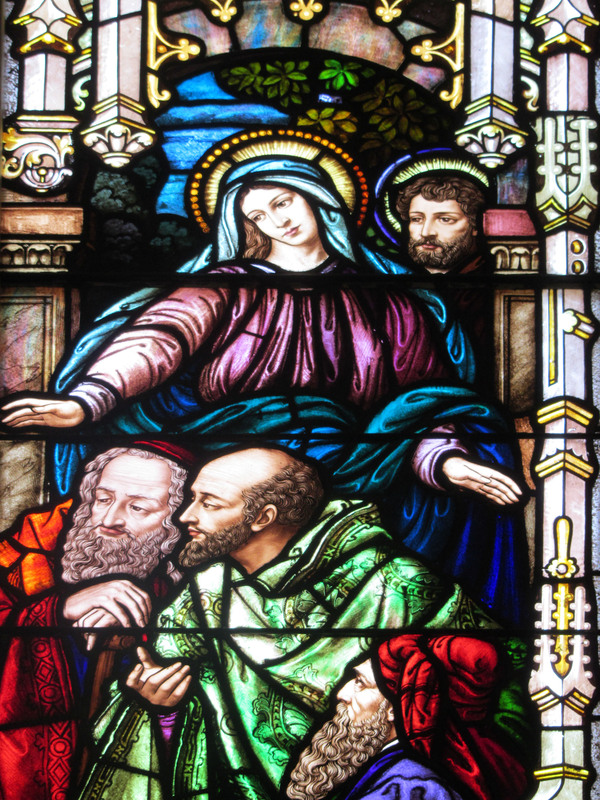 In the right panel, the three kings look at the child in reverence. The gifts of gold (kingship), frankincense (adoration) and myrrh (embalming at death) are symbols of Jesus’ humanity. The Epiphany is celebrated on January 6. The symbol I.H.S at the top means Jesus. This window was donated by Mr. and Mrs. Frank Schloegel. The story of Mary and Joseph presenting Jesus in the Temple is from Luke 2:22-38. Here on the left we see Joseph and Mary bringing the infant to the temple. Joseph holds a cage with some doves to be offered as a sacrifice. Simeon experiences the fulfillment of a prophesy as he takes the infant Jesus into his arms. The prophetess Anna is present as well. The doves at the top of the window represent the Holy Spirit. This window is dedicated in memory of Mr. and Mrs. John Rohrer. 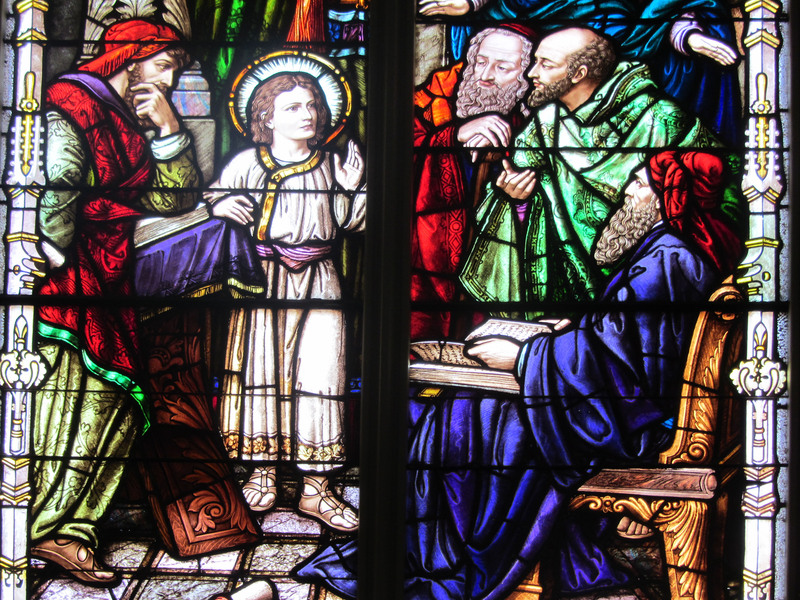 In this window we see the young Jesus preaching and around him the elders listening in amazement as told in Luke 2:46-50. Mary and Joseph have been worried but are relieved to find him. The tablets at the top of the window symbolize the Law of Moses. This window dedication reads Altar Society 1928. 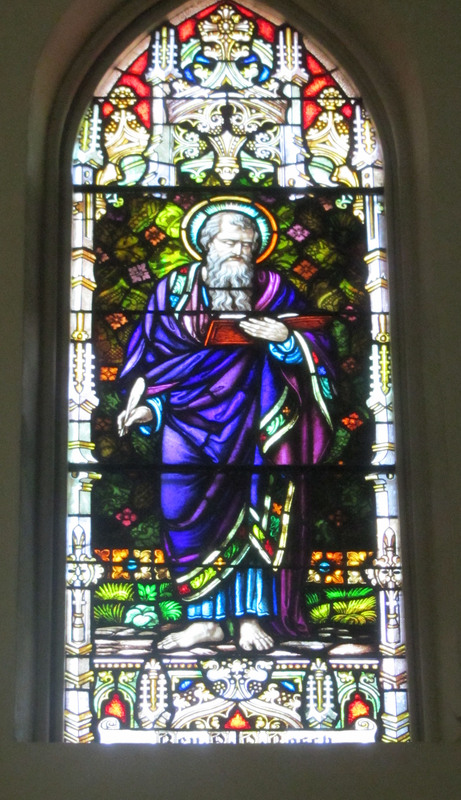 This window was dedicated to the memory of Emil D. Rohrer. The story of Jesus and children is found in Matthew 19:13-15. 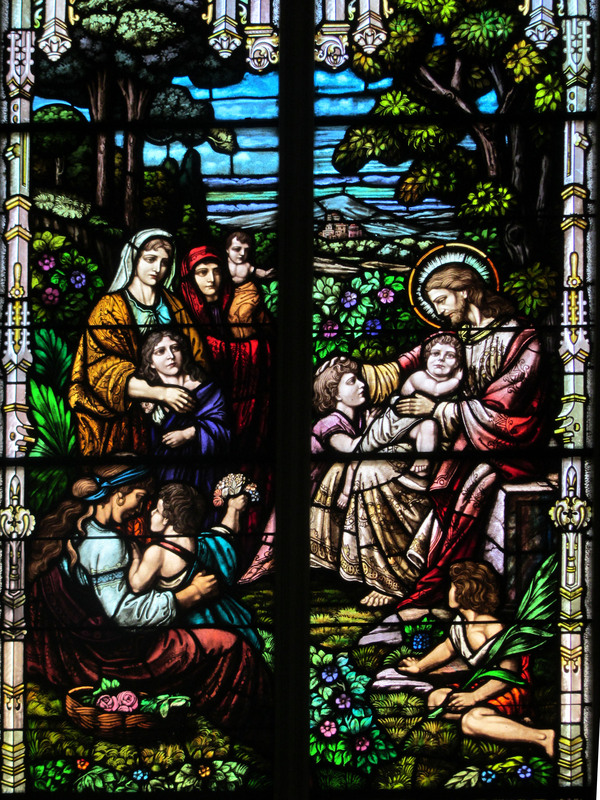 In this window Jesus surrounded by young children and their mothers. The children are contrasted with the Pharisees and the rulers. The city of Jerusalem in the background is a symbol of the kingdom of God. It is a free gift. The disciple is to trust, be receptive and have the dependent nature of a child in order to receive the gift God offers. 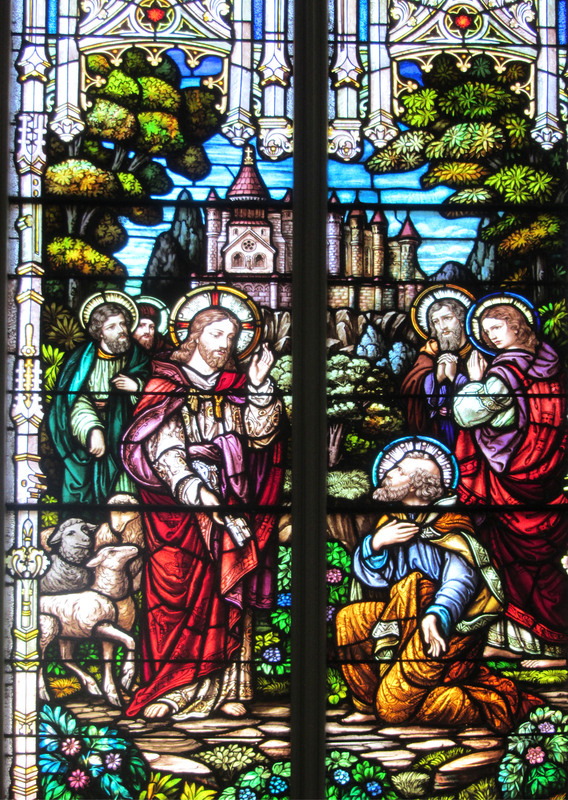 The story in this fourth window is taken from Luke 7:18-30. The Disciples stand with Jesus who goes against the tradition of the Pharisees prohibiting healing on the Sabbath. The Pharisees observe Jesus healing those around him. 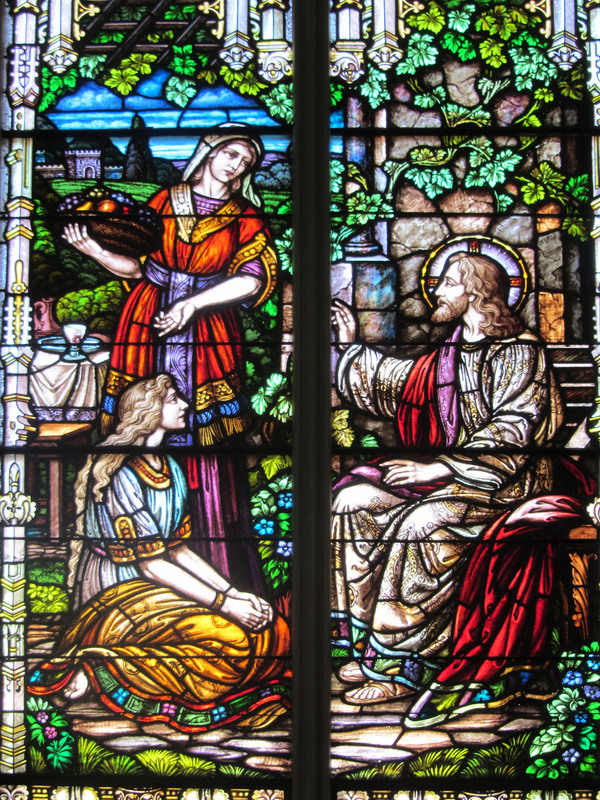 The symbol at the top of the window tells us that the Sacraments remain an outward sign that the Church continues Jesus’ healing ministry, especially the Eucharist. Many instances of healing are suggested in this window. This window was donated by Mr. and Mrs. Louis Richter. In this window the young Jesus is with Joseph and Mary in the carpenter’s workshop in Nazareth. Luke 2:39-40 tells us that the child Jesus grew to maturity in Nazareth and God’s favor was with Him. The beehive at the top of the window symbolizes community. The Sunday after the birth of Jesus is called the Feast of the Holy Family. This window was donated by Mr. and Mrs. Joseph Loschke and Family. This window depicts two important stories. It seems to suggest the moment In John 21:17 when Jesus tells Peter to feed his lambs. Jesus is giving his apostles authority over the New Israel of the Church. In Matthew 16:17 Jesus gives Peter the “keys of the kingdom of heaven.” At this moment Peter is given the role of leader of the apostles and authority in the formation of a new Christian Church. This is the delegation of authority of the Pope as head of the Catholic Church. The symbol at the top in the middle of the window shows a Tiara as a symbol of the crown of authority and power. 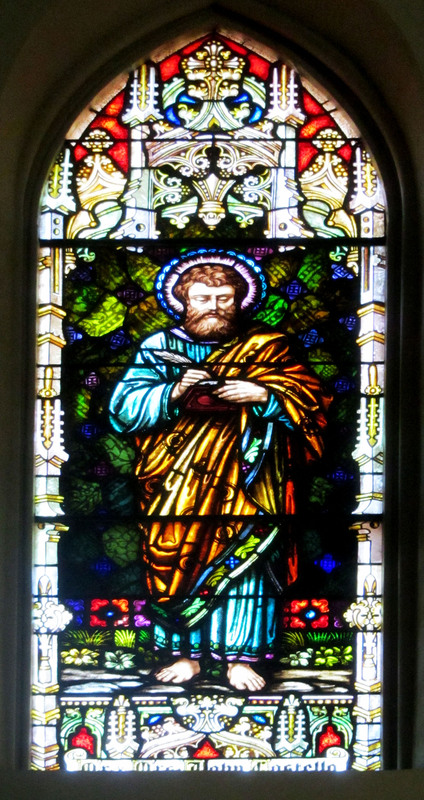 This window is dedicated in memory of George Muehlebach. An additional window, slightly smaller than the ones along both walls, is directly across from the altar. 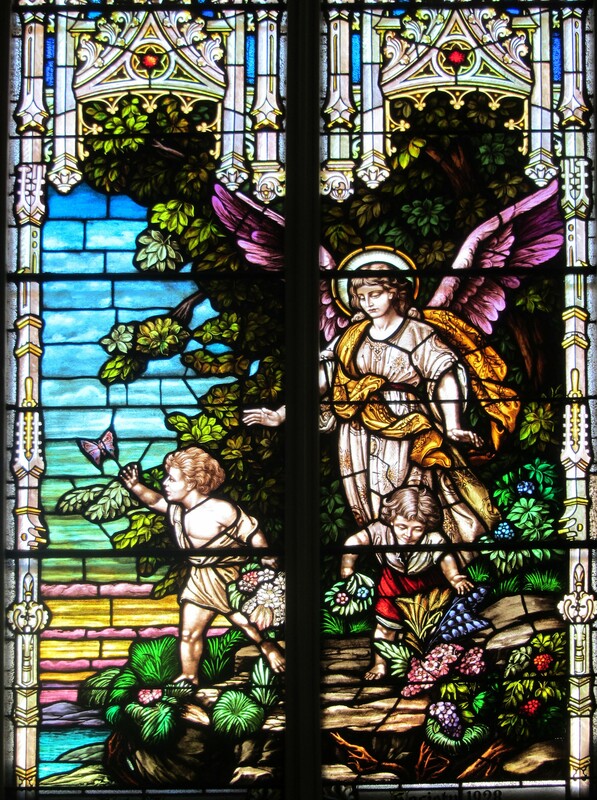 Here the Guardian Angel, a protector and messenger from God, walks with two children in a field of flowers.The dedication for this window is the Holy Name Society 1928. A series of four windows are placed high above and behind the altar in the sanctuary. Onthe right, John and Luke. At the rear of the church, between the nave and the vestibule, there are three large medallions placed into the clear class panels. The Tiara is the Papal crown worn by the pope for ceremonies, processions, etc.. I.H.S is a sign and symbol meaning Jesus (from the Greek), and the Mitre is a kind of cap universally worn by Catholic Bishops as a sign of his primacy. In a small room off the vestibule, in a room which now serves as a restroom but was formerly the Baptistery, are two windows. 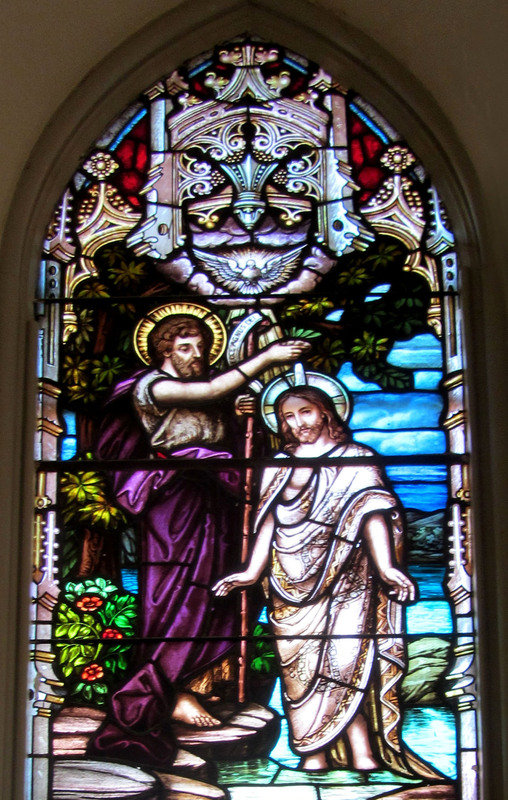 One is of John the Baptist baptizing Jesus. No dedication is noted for this window. 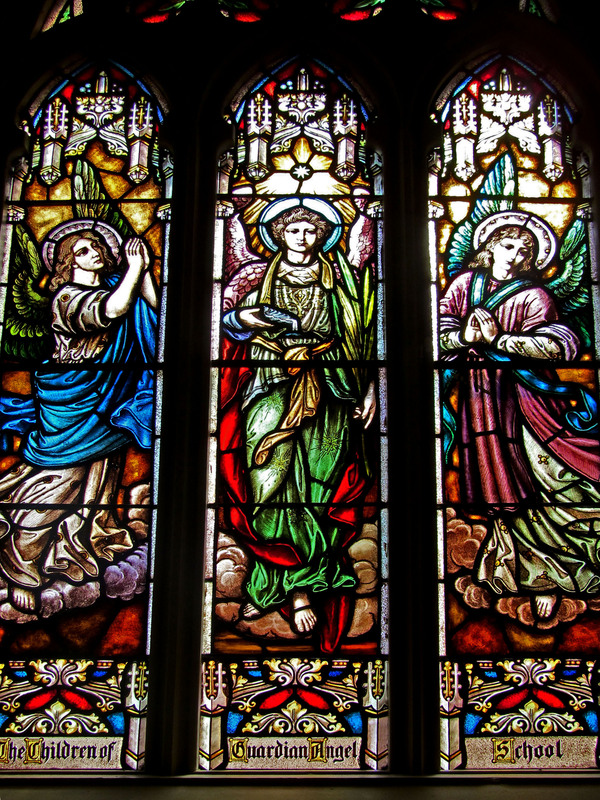 The second window in this small room shows three Angels. On the left is the Angel Michael. In the middle is Raphael, and on the right Gabriel. 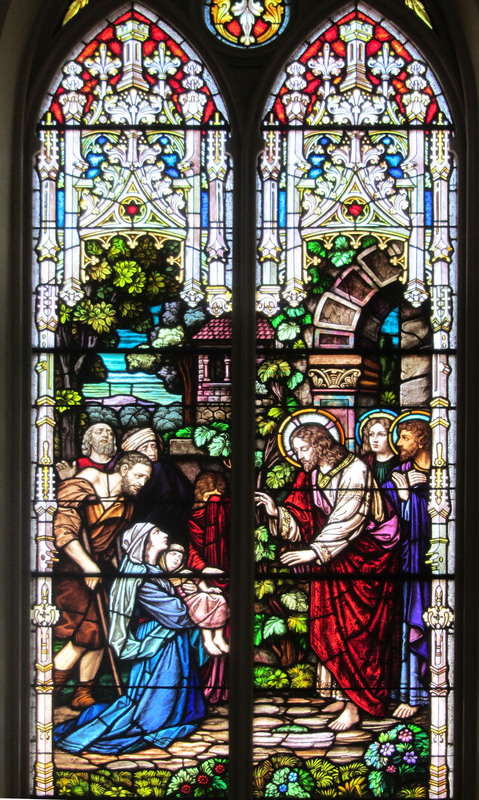 This window is in sharp contrast to the rather simple, even austere depiction of the Baptism. Here, each of the Angels is draped inflowing fabric, with glorious colors. There is an aliveness and excitement in the painting and the realization of these figures. 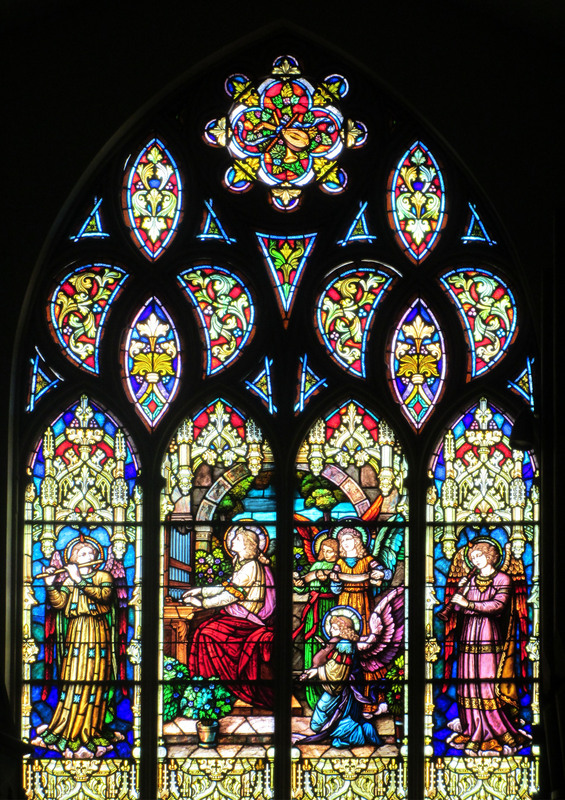 This window was donated by (or dedicated in honor of) the Children of Guardian Angel School. Note the use of Angel rather than Angels. High above the entrance to the Nave, and the entrance to the church, is a balcony, choir/ organ loft. Above this balcony, on the east wall of the church, rises a large glorious window with four panels. At extremes on either side stand angels playing their musical instruments. 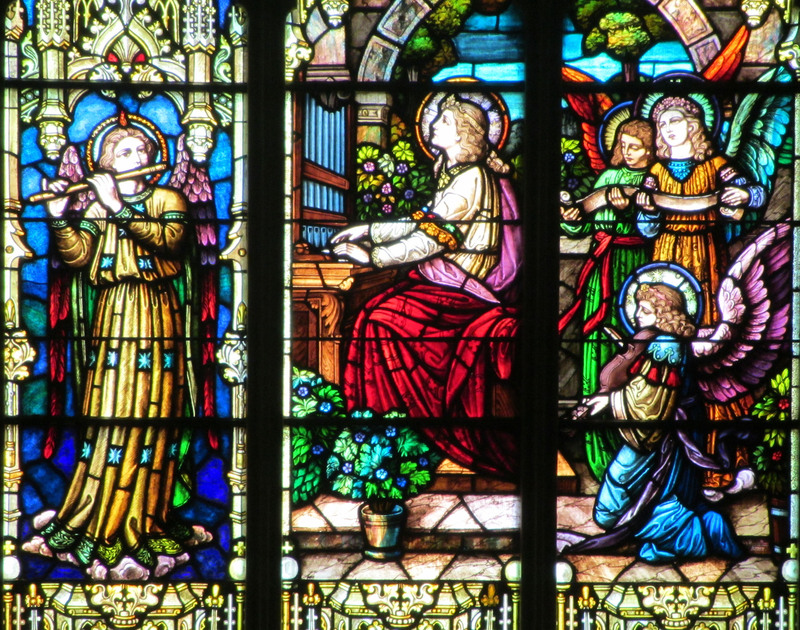 The center two panels show St. Cecilia at her small organ on the left and a group of angelic musicians joining her in song and celebration on the right. St. Cecilia is the patroness of church music in the Catholic Church and the patroness of musicians in general. The organ is her attribute and she is represented here playing the organ. 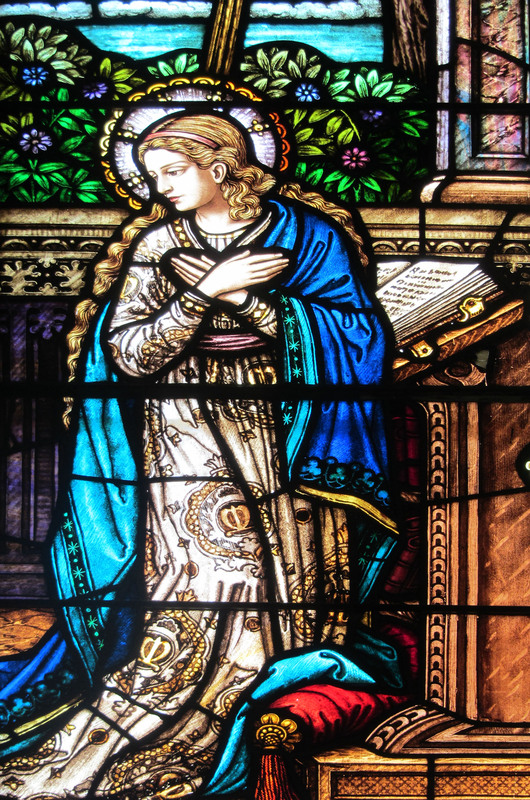 The feast of St. Cecilia is November 22. This window is dedicated to the memory of Rev. Wayne A. Gollihar.